What Does It Mean to Get an Electric Panel Upgrade? People opt for an electric panel upgrade for many reasons, many of them linked to the increasing electrical demands of modern households. In today’s world, we need more power than ever as the devices we use become more sophisticated. With the growing importance of the technology around us, having an electrical panel that can support it all is critical. Beyond maintaining the standards of living we desire for ourselves and our loved ones, an electric panel upgrade is also necessary when it comes to safety. How Do I Know If I Need an Electric Panel Upgrade? You might be unsure of whether you need to look into upgrading. Luckily, once you know which signs to look out for, it will become fairly obvious if you’re overdue for a new panel. If you’ve noticed evidence of rust or deterioration on your panel, or crackling sounds coming from inside it, your panel needs replacement as soon as possible. Other signs to look out for won’t be on the panel itself but linked to it. These include appliances that aren’t running at their full power, two-pronged outlets, a lack of GFCI outlets in bathrooms, and the need to unplug one appliance in order to safely plug in another. What Benefits Come with an Electric Panel Upgrade? A new panel can help your home accommodate more outlets, which can be a big plus if you’re renovating areas that use many appliances. Adding more equipment with high energy demands, like heavy duty tools and central air, can be a safer endeavor with a newer panel. Today’s panels focus on safety, and that is the most significant benefit of upgrading. Older, worn out electrical panels can lead to current overloads, which can damage your appliances and even start a fire. Going with a new panel brings added convenience and flexibility, as well as improved safety for your home and everyone living in it. An electrical panel that works the way it’s supposed to is essential for the homes of today. With all the devices we rely on, having a system in place capable of accommodating all of them is crucial. More importantly, an updated panel is essential when it comes to the safety of you and your loved ones. If you’re concerned about your panel, or if you have questions about upgrading it, get in touch with qualified professionals as soon as possible. There’s no reason to wonder or wait to see if you can fix it yourself. 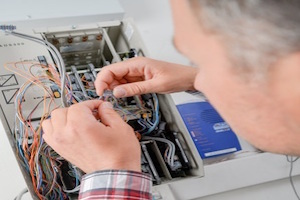 The experts at Bryan Electric, Inc. can provide you with everything you need to know about getting an electric panel upgrade. We are here to answer your questions and provide you with the options to meet your electrical needs and budget. Visit Bryan Electric online or give us a call at (770) 680-2144 today.